I did this cross in 2010. The parents were S. leucotricha and S. ramboi (known at that time as S. "Desafinado"). This cross was part of a project to make all three crosses in the triangle containing the two species above and also S. glazioviana. I did the other two crosses in 2009 and 2010; the results are reported elsewhere. This picture was taken in May 2013. 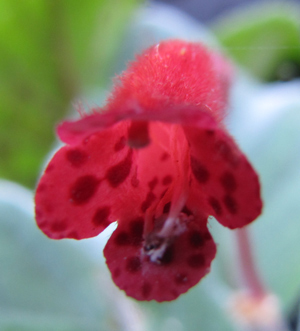 As is true of many sinningias, this hybrid improves with age: sturdier stems, larger leaves, and more flowers. This picture was taken in May 2017. 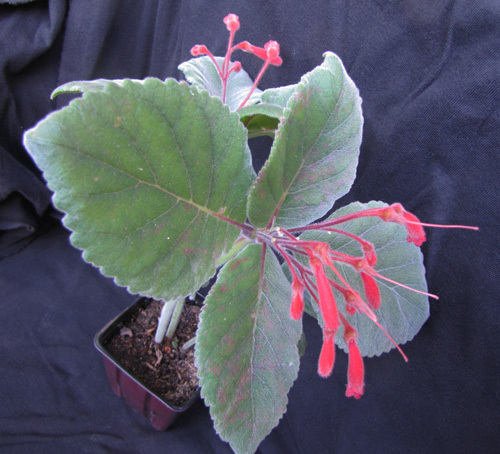 There is potential for further hybridizing here, to bring out more silver hairs on the foliage. 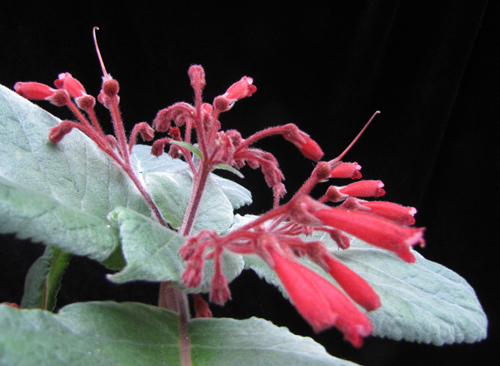 This plant has reasonably attractive foliage and flowers. The dark leaves are inherited from the ramboi parent. The hybrid flower has the markings of ramboi, which is a plus. It happened again! Ten years ago, a plant fell off its stand during the winter and landed upside down, with interesting results. In the winter of 2016-2017, we had another example. In this case, the plant fell on its side. When discovered, the new stems were growing straight up, which meant parallel to the soil surface. I righted the pot and only a few days later, remembered I should have taken a picture. 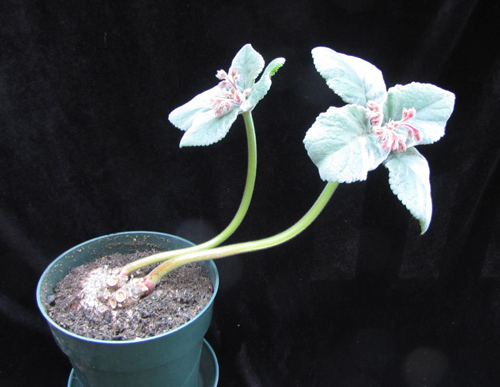 By the time the plant was photographed, it had started to correct its growth direction. It was much more dramatic when it was first found lying on the ground. At that point, once the pot was righted, the stems were horizontal. Growth Determinate, like both parents. Leaves Dark green with red midveins, like the ramboi parent. Inflorescence Terminal peduncle, like the ramboi parent. Season Blooms in spring, like both parents. Flower Tubular. Dark lustrous red, with dark spots on corolla lobes. From seed A couple of years to bloom, under my conditions. Yours are better.